Here is a little goddess-related mystery. 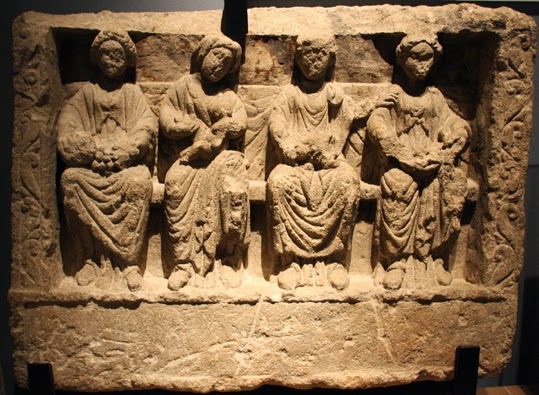 This sculpture showing four mother goddesses is in the Museum of London and dates from Roman times. A notice beside it at the museum says that it was found reused as building material in the wall of the river Thames near Blackfriars. The sculpture is a limestone relief of three women holding holding bread, fruit and a dog and also suckling a baby. The notice says: "They are probably portraying the three native mother goddesses although the fourth figure cannot be explained." I was reminded of this plaque because of book that I contributed to, called Naming the Goddess, has just been launched. It made me wonder if anyone could think of a name for the fourth goddess. If you think you might have any suggestions as to who the fourth goddess could possibly be, do leave a comment. Does it give names for the three native goddesses? The notice beside the sculpture says" "They are probably portraying the three native mother goddesses although the fourth figure cannot be explained." As far as I understand it, the three mothers, or the Matres, are relatively common in iconography in Celtic/Roman Britain. Not quite sure what their actual names are - I have just heard of them as the the three mothers. how do they know there were only 3 goddess's? Mab, Breda, Mathonwy and Tamesis sound like good suggestions. maybe they are simply all aspects of Bride, one of our oldest goddesses, with many diverse associations, as I am sure you all know.She's my main goddess anyway. Aspects of Bride is a really good idea. She is certainly a goddess honoured in London and one with many different aspects.